larger scales of the Universe. One of the most serious issues is that CDM models predict the existence of several hundred small halos in a galaxy-sized halo, in sharp contrast to the observed number of only a few tens Milky Way satellites; our understanding of star formation process in these scales, which correspond to dwarf satellite galaxies, is yet severely limited, or alternatively CDM models may differ from their standard representation on small scales. Also, actual merging history and star formation in these building blocks of the Galactic components and the difference of these processes from Andromeda are still far from comprehensive understanding. clouds such as their collision and merging. All of these processes are actually controlled by hierarchical clustering of CDM via self-gravity on galactic and sub-galactic scales. Thus, to assess what CDM models predict, it is essential to derive the spatial distribution of dark matter halos in the Galaxy and Andromeda through their dynamical effects on visible stellar systems. Stars are indeed ideal tracers of a background gravitational field dominated by CDM. To progress this near-field cosmology science, we will obtain spectra for millions of stars in the Milky Way and Andromeda in the framework of dedicated PFS surveys. 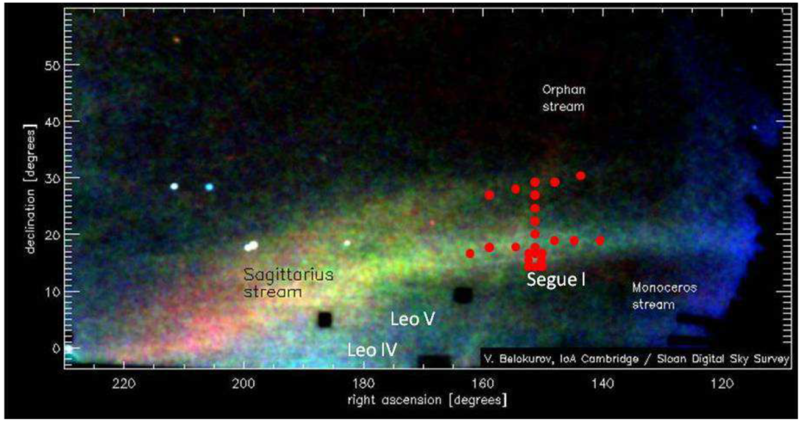 These spectroscopic studies will be in perfect synergy with the upcoming astrometric satellite, Gaia, providing very precise measurements of distances and proper motions for Galactic stars, and next-generation prime focus camera, Subaru/Hyper Suprime-Cam (HSC), providing a large imaging data set in its large field of view. Therefore, PFS in combination with Gaia and HSC will provide us with unique, word-leading data in near-field cosmology and allow us to arrive at our ultimate understanding of the nature of dark matter and associated galaxy formation process in a comprehensive manner. colors represent different satellites (from Freeman & Bland-Hawthorn 2002). These stream-like features disappear after several dynamical times. Right: Model distribution of nearby stars in the integrals of motion space, i.e., E vs. Lz and E vs. L, based on numerical simulations of falling satellites into the MilkyWay (from Helmi & Zeeuw 2000). The different colors represent different satellites. Shown is the final distribution of stars after 12 Gyr within about 6 kpc from the Sun, after convolution with the errors expected for Gaia. It is clear that each of progenitor galaxies can be traced in the current phase space distribution. Several stellar substructures in the Field of Streams revealed in the SDSS imaging data (taken from Belokurov et al. 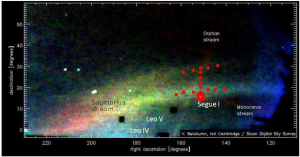 2006), and proposed PFS pointings (filled red circles) over these streams and the surroundings of the faint satellite, Segue I.